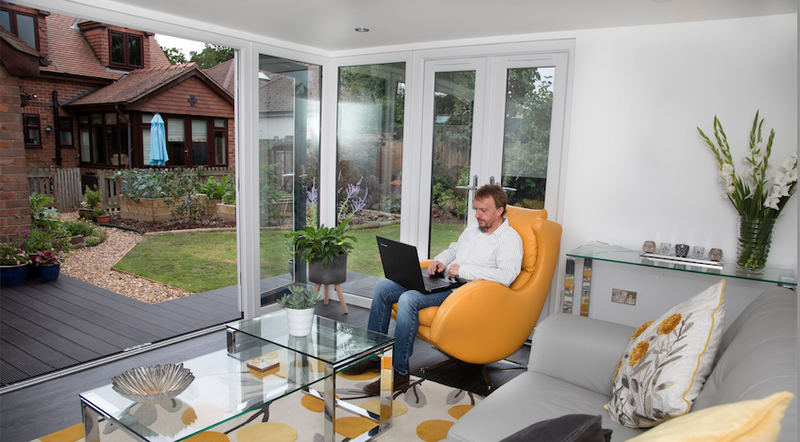 A Garden Room in Chester is used as a Garden Office by former IT manager Rick Bower, Chester, who says he wishes he’d invested in a Rubicon Garden Room years ago when he was working from home from a box bedroom. His newly-built chill-out room couldn’t have come at a better time and the dad-of-five says there’s no better place to relax and unwind than amidst the trees and shrubs in his garden. Rick, is now retired from his job in IT which saw him work with global banking giant Lloyds and software houses. His wife Christine volunteers with local charities. “We already had a wooden summer house but we couldn’t use it in the winter as it wasn’t heated,” explained Rick..
“It didn’t have much light apart from when you opened the door. I really just wanted a room for leisure with lots of light that we could use all year round. 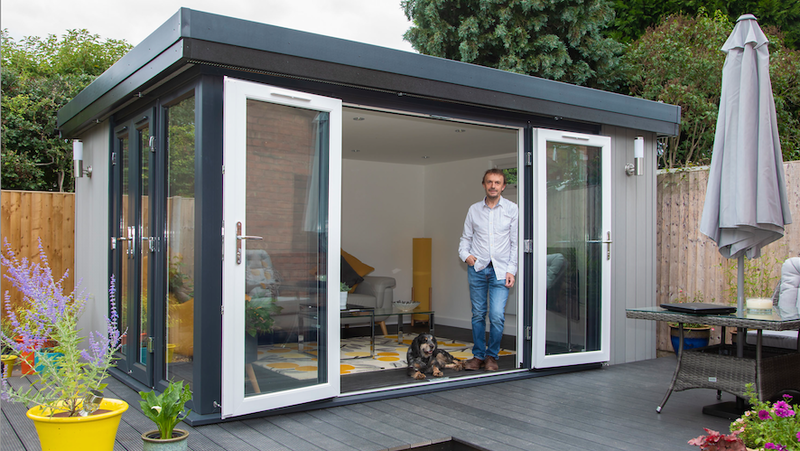 They settled on a 4m by 3.2m Rubicon Garden Room in light grey composite cladding with black trim and black external composite decking to give their new leisure space a modern edge. The room is kitted out with a sofa, television, coffee table and small work top with LED ceiling lighting while patio furniture completes the decking area. Outside, Rubicon has installed two lamps and further LED lighting to create the perfect retreat..
“There’s a small work table but it’s not really for work. It’s a place to be able to put my laptop,” said Rick. “I used to work from home from a back bedroom. I should’ve thought about building a garden room back then as it was the smallest bedroom we have and you’d often feel shut in. “What we have now is a great family space. Rubicon provided a decking area on the outside which now has a table and chairs and a parasol. It integrates with the rest of the garden really well. We sit out there if it’s a hot evening. “I wanted something that looked contemporary. Some garden rooms look twee but they’re not really me. I wanted something low maintenance and that was part of the attraction with Rubicon,” added Rick. The couple were introduced to Rubicon by an electrician they’d hired to disconnect their summer house. “We researched the market for a long time and looked at dozens of companies,” said Rick. The build took just two-and-a-half weeks including all the decking. “It was really smooth from the first day they arrived to the day they left,” he said. “They’re a really good crowd of people and you can tell they know what they’re doing.